President Nicolas Maduro still hopes to establish communication and dialogue with U.S. President Donald Trump’s administration, Venezuela’s foreign minister Jorge Arreaza told the UN Security Council on Saturday. “It is our intention to establish communication and dialogue with the government of President Trump, that offer stands and is still on the table. That is what we have sought to do since the very first day of office,” Arreaza said in UN Security Council meeting on Venezuela requested by the U.S. These remarks came after Maduro on Saturday rejected the ultimatum to call elections and said opposition leader Juan Guaido had violated the country’s constitution by declaring himself as leader. “What we have been saying from the first day of the revolution is that we are willing to sit down with our detractors, our political adversaries and, on the basis of the constitution, reach the necessary political accords,” said Arreaza. This statement reiterates president Maduro’s call for dialogue both with the opposition and also with U.S. President Donald Trump. On Saturday, France, Germany and Spain announced their readiness to recognize the self-proclaimed “interim president” of Venezuela – unless the country holds snap presidential elections within eight days. Venezuela’s President Nicolas Maduro on Saturday rejected an international ultimatum to call elections within eight days and said opposition leader Juan Guaido had violated the country’s constitution by declaring himself leader. “Europe has an insolent position, unsustainable, unpresentable. And it should withdraw its ultimatum. No one gives us ultimatums,” said President Maduro, in an interview with CNN Turk shot on Saturday and aired on Sunday, of European countries join the interventionist policy of the United States and its right-wing allies in Latin America. Maduro has called U.S. Secretary of State Pompeo “a warlord” who speaks with “a lot of despair and hate” in an interview with CNN-Turk on Saturday after the U.S. secretary spoke. Elliott Abrams, who oversaw Middle East policy in US President George W. Bush’s White House, and a hawk, has been included in the Trump team’s point person on Venezuela. Pompeo made the announcement. Abrams pleaded guilty (and was later pardoned) for withholding information from Congress about the Reagan administration’s support for rebels seeking to overthrow the socialist government of Nicaragua. The appointment is an attempt by the US to introduce a direct control of Venezuela as a “future regional vassal,” Russian Foreign Ministry spokesperson Maria Zakharova said. Israel has recognized Venezuelan opposition leader Juan Guaido as the country’s interim president. However, unlike many of those who denounced President Maduro as a ‘dictator’ and ‘usurper’ and urged him to step aside, Netanyahu stopped short of openly calling for any action that might fuel internal conflict in Venezuela. Tel Aviv initially seemed reluctant to take sides, but following reported discussions with US State Department officials and after hearing their passionate performance at a UN Security Council session on Saturday, Israel officially supported the Washington-led effort to recognize the opposition politician as the “legitimate” leader of Venezuela. Venezuela severed diplomatic relations with Israel in 2009. Australia’s government has announced it supports Venezuelan opposition leader Juan Guaido as his nation’s interim president. Australian Foreign Minister Marise Payne said in a statement Monday that the government calls for a transition to democracy in Venezuela as soon as possible. “It is time for every other nation to pick a side. No more delays, no more games. Either you stand with the forces of freedom, or you’re in league with Maduro and his mayhem,” Pompeo told the UN Security Council on Saturday during an emergency session called by the U.S.
Pompeo told the UN that the socialist Maduro must go. Guaido, who is challenging socialist President Maduro’s legitimacy as the country’s leader, is calling on people to take to the streets again. In a live broadcast Sunday evening, Guaido urged Venezuelans to participate in two new mobilizations in the coming week. He says that at midday, Wednesday people should exit their homes, offices or wherever they may be to participate in two-hour protests. For Saturday he is asking supporters to hold mass demonstrations in “every corner of Venezuela” and around the globe. Guaido says the Saturday protest is timed to coincide with a European Union deadline for Maduro to call new elections. Guaido is urging UN High Commissioner for Human Rights Michelle Bachelet to visit Venezuela and witness the crisis herself. Colonel Jose Luis Silva, Venezuela’s top military diplomat in the U.S., said in a video widely circulated on social media Saturday that he supports Guaido. Opposition supporters have spent Sunday handing soldiers leaflets explaining a proposed law that would provide amnesty to anyone who helps them. Guaido has renewed his calls for soldiers to abandon Maduro’s socialist government. He was speaking after a Mass. Guaido was swarmed by television cameras as he stepped out of a Roman Catholic church on Sunday and said he’ll continue to press forward with plans to install a transitional government in Venezuela led by himself and members of the National Assembly. Opposition supporters staged visits to military bases across Venezuela earlier in the day, handing soldiers copies of an amnesty law. Some military commanders ripped the handouts apart, but no violence was reported. The U.S. State Department has accepted a new Venezuelan envoy in Washington who was appointed by Guaido. In a statement, the U.S. Secretary of State Mike Pompeo said Sunday that Carlos Alfredo Vecchio will now have authority over Venezuela’s diplomatic affairs in the United States. Vecchio is a former aide to Leopoldo Lopez, another opposition leader who is under house arrest in Venezuela. Vecchio fled his homeland during anti-government unrest in 2014 fearing he would be arrested. Pompeo’s statement says Vecchio met with Undersecretary of State for Political Affairs David Hale, who reaffirmed the administration’s strong support for Guaido. John Bolton, Trump’s national security adviser, sent a new warning to the government of Venezuelan President Nicolas Maduro. Pope Francis is calling for a “just and peaceful solution” to Venezuela’s political crisis that respects human rights and works for the good of all people. Francis said Sunday from Panama that he was feeling particularly close to Venezuelans in these days of crisis. The Vatican hasn’t said if it would back opposition leader Juan Guaido in his claim for the presidency. Several years ago, the Vatican was frustrated in its attempt to mediate between socialist President Nicolas Maduro and Venezuela’s opposition, which has the backing of many Venezuelan bishops. Venezuela has defused a potential showdown with the U.S. by suspending a demand that U.S. diplomats leave the country even as Washington called on the world to “pick a side” in the South American nation’s fast-moving crisis. Venezuela’s Foreign Ministry says it has extended a deadline for U.S. diplomats to leave following it’s rupture in relations. It says it will provide a 30-day window for negotiating with U.S. officials about setting up a “U.S. 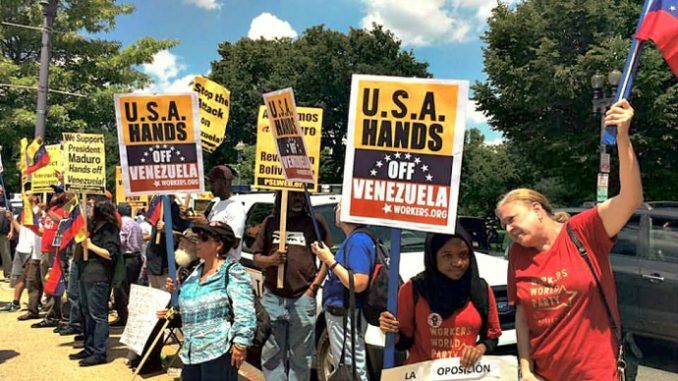 interests office” in Venezuela and a similar Venezuelan office in the United States. Ahead of the grand military drills, President Maduro visited several bases to demonstrate that his legitimacy is backed by the army, which is ready to defend the nation from potential foreign interventions. After the US pledged full support to the self-proclaimed “interim president” Guaido, and not ruling out a ‘humanitarian’ military intervention if need be, Maduro said the National Armed Forces must be prepared to defend Venezuela “in any scenario” and announced massive exercises between February 10 and 15. “We are preparing for the most important military exercises in our history,” Maduro reiterated on Sunday while inspecting preparations for the exercises.